Amazon Sumerian makes it possible for anyone to create virtual reality (VR), augmented reality (AR), and 3D applications for a variety of scenarios or use cases. You can build these applications, or scenes, from your browser with Sumerian’s WebGL and WebVR based editor, which requires no prior VR and AR experience or 3D graphics expertise. Design your scene, import 3D objects to place in scenes, and script the logic that controls how your objects behave. 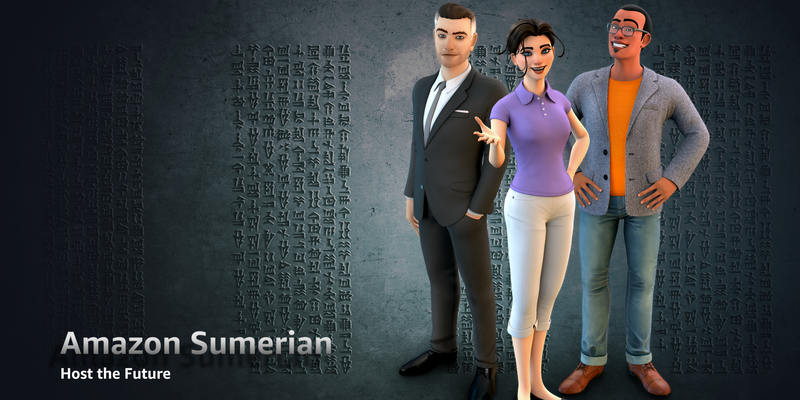 With Sumerian Hosts, you can also add animated, 3D characters that can speak and recognize speech. This enriches your scenes by giving you characters which can talk with your users or narrate your scenes. Getting started with Sumerian is simple and requires no installation or specialized hardware. Simply log in to the AWS Management Console from your browser. To learn more, we have developed an extensive set of tutorials. Sumerian has a simple-to-use editor based on WebGL and WebVR so you can easily author scenes from a browser. You can import 3D objects, select the surroundings for your scene, add characters, and script the logic that controls your scene. 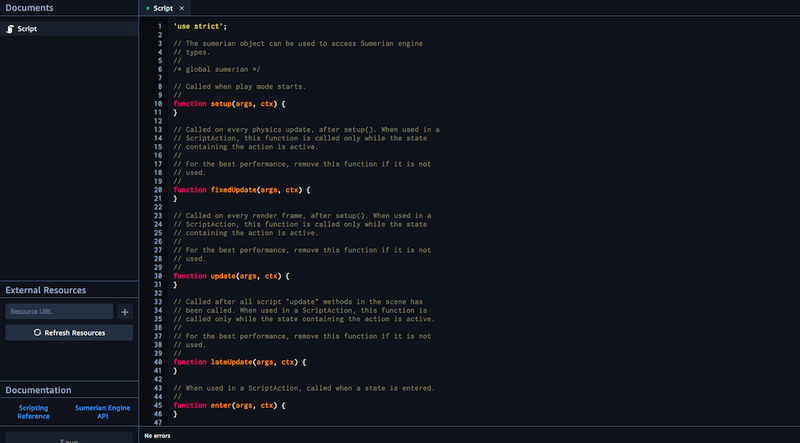 Sumerian’s text editor lets you script the logic behind your scene so you can decide how objects behave or how your scene is narrated. 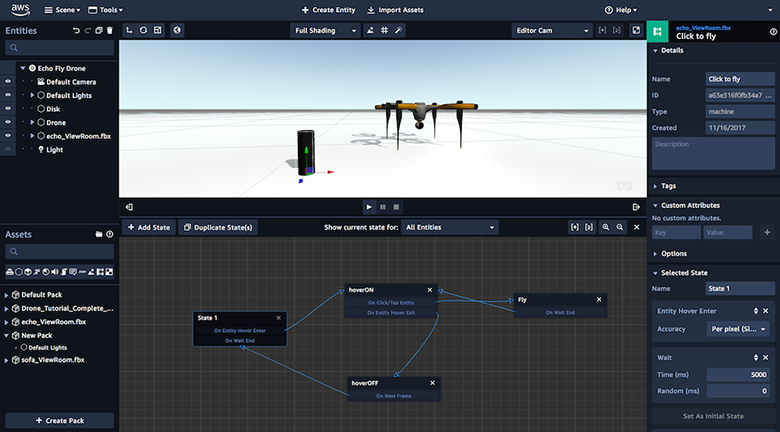 Sumerian Hosts makes it easy to create and add animated 3D characters called Hosts. Hosts can guide your users through a scene by narrating scripts or answering questions. You can select from three Hosts and can customize the Host’s appearance, clothing, voice, and language. Using Sumerian’s integration with Amazon Lex and Amazon Polly, you can enable engaging spoken interactions between Hosts and your users. Polly lets you input text which your Host can speak in lifelike voices cross a variety of languages. Using Lex’s automatic speech recognition and natural language understanding capabilities, you can build a conversational interface for your Host that allows it to understand and respond to users’ speech. For example, you could build a trainer Host that onboards and trains new employees. When employees ask the Host questions, the Host could respond with an answer or a question requesting more information about the inquiry. 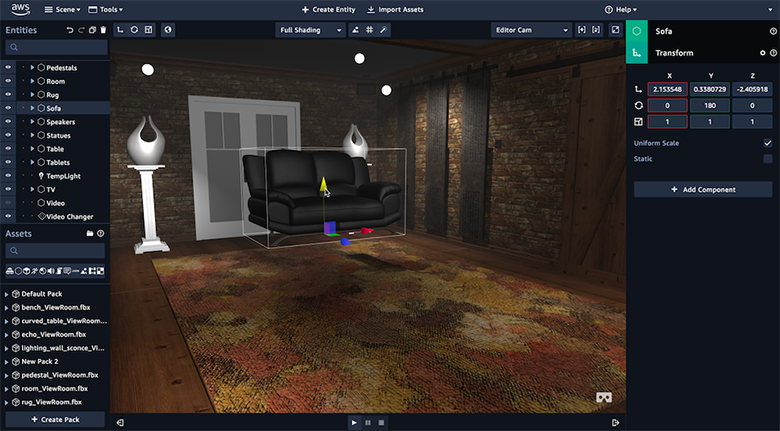 You can import and place 3D objects in your scenes such as furniture, natural objects, buildings, surroundings (e.g. stadium, classroom), and more. Sumerian also comes with templates with pre-populated scenes. Sumerian supports importing FBX and OBJ. 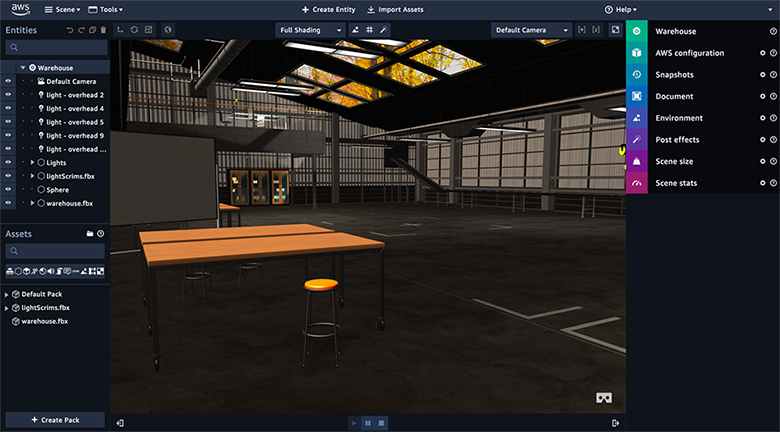 You can choose from Sumerian’s library of pre-built objects, download and import objects from third-party 3D asset repositories such as Sketchfab or TurboSquid, or create and import your own objects. You can define the behavior of objects in scenes and how they react to user interactions. For example, you can make a drone fly up in response to user input. You can build VR/AR applications for platforms such as Oculus Go, Oculus Rift, HTC Vive, HTC Vive Pro, Google Daydream, Lenovo Mirage and AR-compatible iOS and Android mobile devices. Your Sumerian scenes will run in browsers that support WebGL or WebVR. Sumerian hosts your completed scenes in the cloud and serves them from a publicly accessible endpoint, enabling your users to access them from anywhere. To learn more, please visit the tutorials on creating and publishing scenes on various devices.